1. It's compulsory to connect battery to your LinkIt ONE board. It's required almost all time using power from Battery. 2. Download and install USB COM port drivers for LinkIt ONE. If you already installed LinkIt ONE USB COM port drivers before, you can skip this step. 3. Set 3rd party Boards Manager URL Point your Arduino IDE 1.6.5 to our Boards Manager repository. To do this, choose `File > Preferences` from IDE menu. Copy and paste following URL to the "Additional Boards Manager URLs" preferences. 4. Go to Tools>Board>Boards manager and search for LinkIt One. 5. Select "LinkIt ONE" and click install. After setting up your LinkIt ONE, let's start making! After everything is setup nicely, I added in a button for LinkIt ONE to send a status message over to PubNub. This button will allow driver to report bus break down by pressing. Once button is pressed, PubNub will receive the message with status "Break down" and the data will then display on real time map. This feature can be further enhanced by utilizing LinkIt ONE SMS feature to inform service team. User will be able to read the bus speed and bus status from Map. User will be able to see real time movement of the bus too. Frankly, i found that's GPS data is not yet accurate enough for user to track the exact location of bus. That also lead to inaccuracy of arrival time estimation. 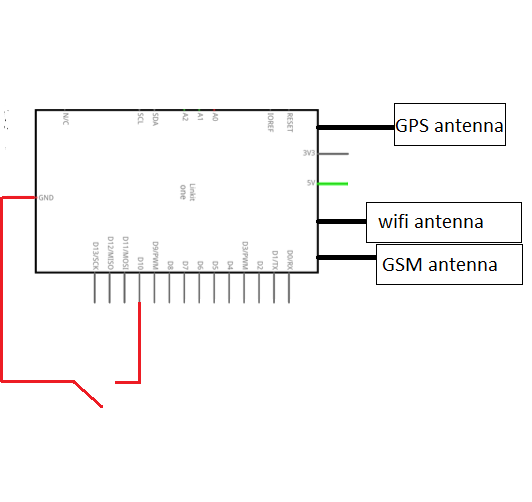 I would like to try using Bluetooth for LinkIt ONE on bus to detect which bus-stop it's reaching. Let's say each busstop having a bluetooth device(beacon: http://kontakt.io/) with the busstop name, and the LinkIt ONE installed on bus is keep on scanning the bluetooth devices around, once it found the bus stop name, it can send the data to cloud and mobile phone user will know which bus stop the bus just passed by.